Although an extremely stylized piano accompaniment is included, Ames and McKay strongly recommend the incorporation of Electric Bass and Drums (at a minimum). Further, the addition of a horn section (2 Trumpets, Trombone, Alto Saxophone, and Baritone Saxophone) truly brings the celebratory nature of this piece to the forefront. 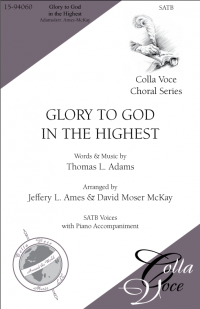 “Glory to God in the Highest” requires a competent soloist who has the ability to sing in a gospel, pop, or R&B styling.